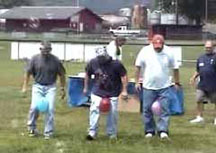 West Virginia Entertainer for ARS, Audience Response Systems, Audience Participation Games and Karaoke for Conventions! Sandy Sowell is proud to present unique, exciting entertainment and rental games for business promotions, conventions, fairs, and school functions in West Virginia, Pennsylvania, Ohio, Kentucky and Virginia! Sandy Sowell has just added Sandy Sowell's Audience Response System [ARS], a technical support service available for seminars and conferences featuring 150 keypads and instant polling capabilities. 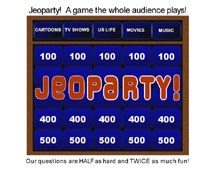 Based near Charleston, WV, our audience-participation shows and games help people relax and get to know each other better!...events include Karaoke, Jeoparty, Surviving the Obstacles and Guitar Hero, as well as our ever popular Game Show Mania, Giant Twisted, Horse Racin' Game and Speed Pitch!!! Get to know more about SANDY SOWELL - and you'll see why her experience in the entertainment industry makes her shows so SPECIAL! TESTIMONIALS! Find out what many SATISFIED CUSTOMERS are saying about our dedication to quality production and professional service. Check out our IMPRESSIVE LIST of CLIENTS who have used our services! How do you keep 150 people engaged and participating in a meeting? 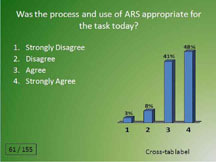 Sandy Sowell's Audience Response System (ARS)! Sandy Sowell's Audience Response System (ARS) is available to provide state-of-the-art wireless audience response services for seminars and conferences. Audience polling is a great method for receiving real-time feedback from meeting and conference participants! This increasingly popular concept is accomplished through our interactive response system that gives each person the ability to respond to multiple choice questions with individual wireless keypads. The results are immediately displayed on the large video screen. Sandy Sowell and her trained staff monitor the 150 keypads and software for this service. DOWNLOAD THIS 2 PAGE PDF OF SANDY'S 4 MOST POPULAR SHOWS! JEOPARTY is Sandy Sowell's latest interactive, trivia-based game show that lets 150 people play along using radio-frequency, wireless, Audience Response System keypads. It gives the whole audience the ability to participate! JEOPARTY questions are easy and fun! Playing Sandy Sowell's version of this familiar game is engaging and thoroughly entertaining for all ages! Bright backdrops and large projection screen set the stage for this visually exciting game. 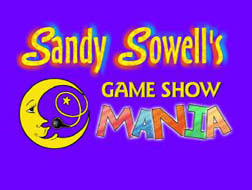 GAME SHOW MANIA - Sandy Sowell's best selling event! 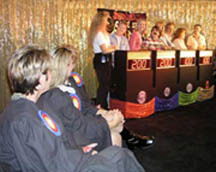 Her unique TV-style Game Show Mania includes very simple trivia questions for all ages, plus the glitter, flash, and flourish of an in-studio production: sequined backdrop, music, lights, announcer, electronic scoring, sound effects - all the bells and whistles! We bring you all the high spirited fun, laughter and excitement of a live television game show! 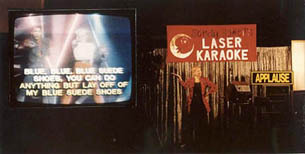 Sandy Sowell's Laser Karaoke Show is a stage show with 3500 songs that puts you and your friends in the spotlight and makes YOU THE STAR as you sing your favorite songs to a professional backup. Sing solo, duo, trio, or as a group. You will receive, compliments of the sponsoring event, a FREE CD of your performance. It's a Brand New Show! Sandy Sowell's Horse Racin' Game.... Big screen TV and actual footage of 7 horse races narrated LIVE by Sandy herself. In Sandy Sowell's usual style there will be some audience participation surprises in the evening as well. It's an innovative fun-filled social event that is perfect for a fundraiser or after dinner entertainment! A cross between Survivor and a traditional Obstacle Race, Surviving the Obstacles is a team building event fun to participate in and maybe even more fun to watch! We have an array of challenges that can be performed depending on space considerations. Perfect as a team builder or ice breaker. It's an Antique Show that we have taken on the road and spiced up with Sandy's signature "audience participation game". 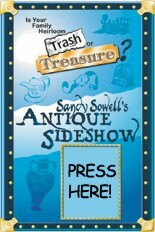 It's called "Sandy Sowell's Antique SideShow" and you will love this new twist on that favorite television show. Heat up the dance floor and put your skills to the test as you move to the groove! Dance Dance Revolution! Step into the spotlight and show some moves in a game that will make you feel like you're in a disco inferno!!! Using small wireless guitars with big fret buttons, the two Guitar Hero contestants must play scrolling notes to complete a song. The graphics are fabulous. Kids love it, and adults love it too. As a stand alone competition with giant-screen TV, a big sound system, and trophies for the winners, Guitar Hero is great! Photo video scrapbooks are a beautiful way to share the story of someone's life with others and are the ultimate gift for your family members and friends. Sandy Sowell has once again added to her list of adventures and accomplishments. She is now an official consultant to the Caribbean based Sandals' chain for her new GAME SHOW MANIA. She traveled to SANDALS NEGRIL in January 1999 to perform her TV-style quiz show for the guests there. As part of the package she also conducted a workshop for the social directors to better enable them to perform and emcee it themselves on a weekly basis at the resort. In May 1999 she traveled back to Jamaica to teach Game Show Mania at BEACHES NEGRIL, another Sandals resort. There are now other Caribbean resorts expressing interest in her new Audience Participation Consultation Service. * * * CARIBBEAN RESORTS * * * consider the purchase of our new MINI GAME SHOW PACKAGE and on-site training! * * * DON'T FORGET * * * to check out Sandy's SPEED PITCH, GIANT TWISTED and her picnic CARNIVAL GAMES! NEWSPAPER ARTICLES on Sandy Sowell Entertainment!